• Hawaiian Legacy (cd425) • Kapena Is Da Crew (cd536) • Keys Of Love (cd712) • Collection Vol 2 (cd538) • Collection Vol 3 (cd534) • Kapena and More.. Features "Pena Boy" the 14 year old son of Kapena founding member "Kelly Boy". 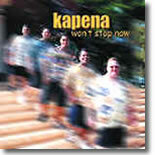 Kapena is a household name in Hawai`i with 16 CD releases over the past 14 years. Kaua`i has been fortunate to have received them numerous times as entertainment for our yearly Farm Bureau Fair.